1. Wood Markers: You can pick out sticks or 1×2 cedar in short 1ft lengths [more or less as you like]. The kids can carefully carve points on the ends for pushing into the ground. Then then can draw [paint or sharpies] on the wood. On sticks you could create flags with tape to draw on. 2. Rock Markers: Find rocks and have the kids paint names of the plants/veggies in the garden. These turn out super cute. Any rocks work. I like to take the kids on a walk to find the “right” ones for them. 3. 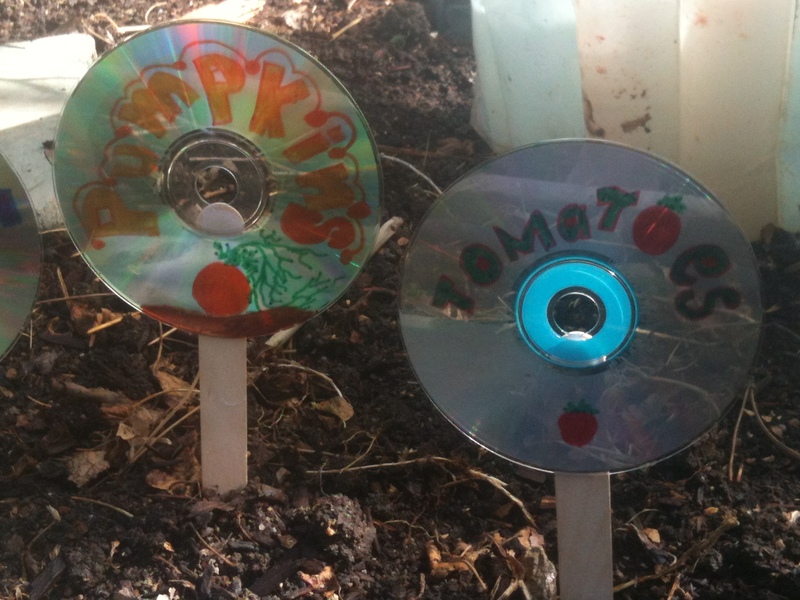 Recycled CD Markers: Remember all those old CDs sitting around that you never listen to? The ones that clutter your house. Grab some of those [If you don’t have them ask a friend or neighbor!] and have your kids use sharpies to write the names of each of your plants/veggies. They can add artwork or whatever they like. They could easily embellish with gems or stickers [great for little kids!]. We then used a glue gun and some popsicle sticks to make the stake. They love them and they were so easy! What every you decide to do consider having your kids go into the garden with you and write down a list of the different veggies/fruit you have. They can do some fun math with this one [e.g., if we have 5 tomato plants, 6 pepper plants, & 3 basil plants, how many do we have all together]. They can also get some writing practice by writing down the different types of plants for which you need markers. The ideas are endless. Whatever you do have fun with it! It always helps if you stay involved and make some markers or something else that has to do with the garden at the same time. How do you get your kids involved in the garden? This entry was posted in Boulder, Crafts, DIY, Nature, Outdoors, Uncategorized and tagged children, DIY, Families, Gardening, Nature, Outdoors, projects by Boulder Families. Bookmark the permalink.